-Shell & devein prawns but retain the tails. -Marinate the prawn with dash of salt and set aside. -Place 10pcs cabbage leaves on a plate, steam the cabbage leaves until softened. -Place 1pc leaf of cabbage flat on a plate. Spoon fish paste onto leaf and press evenly. -Add 1pc prawn on the fish paste. Fold both side of leaf over the stuffing. -Roll up the cabbage tightly and repeat the rest of the cabbages leaves. 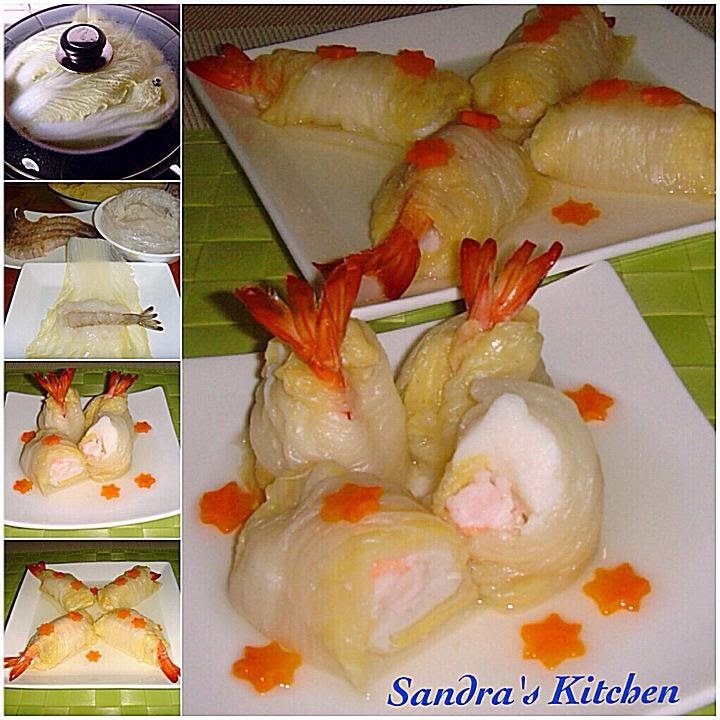 -Place the seafood cabbage rolls, carrot stars and pour the chicken broth onto it. -Steam in high heat for 4-5mins or until the prawn tail turn to red. -Remove and transfer to serving plate.